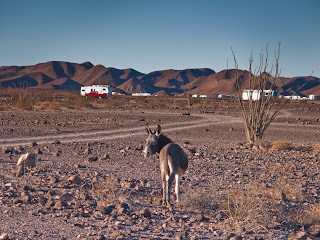 We arrived in Quartzsite on Tuesday afternoon. It was peaceful, and the traffic wasn't too bad. Today is Saturday and what a difference four days make. 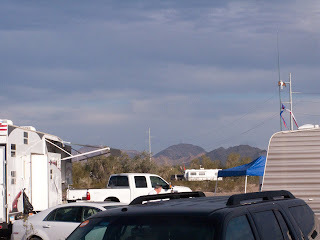 The big tent rv show is going on, and thousands are now camped close by in the desert. In fact, too close. After coming from the peace and solitude of the Imperial Dam BLM, it feels like NYC. These two pictures illustrate very well the difference 60 miles can make. We joined the mob at the rv show, but soon left. I do not enjoy being elbow to elbow with people checking out the latest in time sharing campgrounds and miraculous healing magnets or copper bracelets. There are a few things we want to go back and check out but we'll wait until Monday when the weekend crowds have gone home. We went out for awhile this afternoon, and when we were coming back we couldn't find our RV. We knew we were in the right area,but couldn't spot our rv. We then realized another group of 5th wheels had set up literally 15 feet behind our coach. Why is it that human beings feel the need to group together so close even when it isn't necessary? The last time I checked, we are in no danger of being attacked by Wolves or raiders. In fact the greatest risk is probably the fumes from all the generators running unless you are like Bob and Linda who have a great solar power system. Speaking of power, our 4 house batteries are dying and it is time to replace them so Monday we are buying 4 new batteries. Which brings me to my next point. Why are we here? Well first there are a lot of suppliers here fixing and selling rv stuff. If you shop carefully you can actually find pretty good deals. Second it's the people. After my rant you might wonder what I mean. No I don't like the masses, but we are with a group of 8 or 9 couples that Bob and Linda know. We weren't sure we were up to the task. Judy and I tend to be fairly private and much prefer being with one or two other couples at a time. But the group has warmly welcomed us in and we have enjoyed getting to know everyone. By the time we leave on Thursday we might even have everyone's name straight. Mollie is also working on her social skills and gets a B+ for her first fireside visit. I think there are at least 8 other dogs here in our little group. So basically the problem with Quartzsite is very simple...... it's ME. I need to work on being more flexible and tolerant. I thought I was done with that lesson, but apparently not. Till next time.